In 1863 the Dunedin Gasworks was the first place in New Zealand to produce manufactured coal gas. It closed in 2001 and the remaining structures and plant now form the Dunedin Gasworks Museum. Aerial photograph of the Dunedin Gasworks, circa 1960s, Dunedin City Council Archive, DCC G photo 4. Manufactured coal gas, or town gas, was first used in Dunedin for central city street lighting. The enterprise was led by important Southern Hemisphere gasworks engineer and developer, Stephen Stamp Hutchison, and the Dunedin Gas Light and Coke Company. Other main centres soon followed suit and within a few decades most large towns and cities in New Zealand had at least one gasworks. During the 1880s demand grew and gas heating and cooking gained popularity. The Gasworks was also essential to local industry, powering it as well as supplying coal gas by-products - coke and tar. For many years the local council considered buying Dunedin Gasworks and, after much debate, on 1 January 1876 it became the owner. The Gasworks was generally a profitable business for the Council, although less so as electricity rose to prominence. By the 1980s the feasibility of manufacturing coal gas had declined, so Dunedin stopped in 1987. The Council then converted the Gasworks for Liquid Petroleum Gas (LPG) and tempered LPG distribution until 2001. 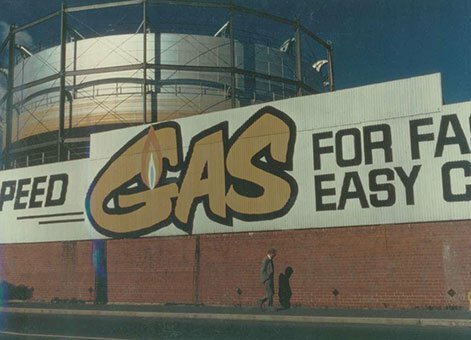 Gasholder and sign, circa 1970s. Dunedin City Council Archive, DCC G photo 18. When manufactured coal gas ceased the Dunedin Gasworks Museum Trust was established, their goal being the preservation of aspects of the Gasworks. The Dunedin Gasworks Museum opened in 2001 and consists of the Gasholder frame (1881), the brick Fitting Shop (circa 1900), and Engine House whose earliest sections are thought to date from the 1860s or ‘70s. This building has the gasworks’ landmark chimney attached to it, and also features the Gasworks’ remaining working steam engines ranging in date from the 1860s to the 1960s. Various processing and storage tanks are also still present. Gasworks were an essential part of many people’s lives from the mid to late 19th century and into the 20th. Complexes as complete as the Dunedin Gasworks are now globally rare, which means this place has special engineering heritage value. Dunedin Gasworks was added to the IPENZ Engineering Heritage Register on 25 February 2014. Gasholder of 1879 (List no.4398). The Dunedin Gasworks site covered most of the block bounded by Andersons Bay and Hillside Roads, Braemar and McBride Streets. 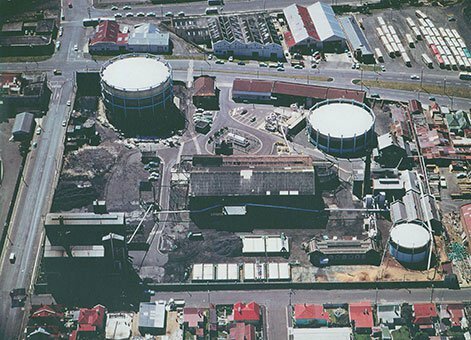 Structures such as gasholders occupied other city sites and the extensive network of gas reticulation infrastructure fed much of the city of Dunedin (pre-1989 territory). The Dunedin Gasworks Museum entrance is at 20 Braemar Street, South Dunedin. For opening hours and further information see Dunedin Gasworks Museum website. Megan Cook. 'Energy supply and use - Coal and coal gas', Te Ara - the Encyclopedia of New Zealand (updated 12 April 2010). Erik Olssen, Building the new world: Work, politics and society in Caversham 1880s-1920s (Auckland: Auckland University Press, 1995). Peter Petchey, ‘History of Dunedin Gasworks,’ Dunedin Gasworks Museum Trust, 2009 (PDF 330KB). ‘The Engine House, Dunedin Gasworks Museum: A Guide to the Museum's History & Displays,’ circa 2001. ‘The South Dunedin Gas Supply,’ Otago Daily Times, 8 May 1883, p.2.